· Ultra low wear loss as a result of the transformation-toughening mechanism unique to the yttria stabilized zirconia (YSZ) material system. · Higher grinding efficiency and reduced grinding time due to zirconia’s higher density (compared with alumina and glass). · Most durable grinding material, reducing operational cost in the long run. Wear rate substantially lower than Al2O3, CeO2-ZrO2, and MgO-ZrO2 grinding media. · Suitable for high velocity operations and wet grinding operations. · Iron- and chrome-based magnetic materials (for audio/video recording tapes) and other magnetic materials. · Electronic-grade ceramics (ferroelectric, piezoelectric, dielectric, capacitors, sensors, etc. 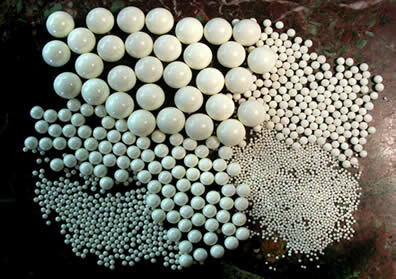 ), advanced structural ceramics, and other ceramic ingredients. · Nanostructured and superfine powders. · Toner materials for photocopiers and laser printers. · Inks, dyes, paint, and other pigments. · Pharmaceutical, food, chemical, and textile applications. · Lab milling operations demanding minimized contamination from milling media. · Larger-sized media are more efficient in breaking up large particles. · Smaller media are more efficient in milling smaller particles because of higher effective contact area. · Larger media sizes are favored in many conventional ball mills. Smaller sizes are more appropriate for attritors. For example, 5mm media are used in many attrition mill applications, whereas 10-15 mm may be a good start for a lab ball mill. For small-media mills, media sizes are typically smaller than 2 mm. · Another important criterion in selecting media size is the gap size between stirring arms and mill walls. Media size should be significantly smaller than the gap size to prevent jamming.